Click here to go direct to job costing in the manual, including video instruction. We’ve made the Job Costing module easy with the use of tabs and eliminated the cumbersome task of entering jobs one at time on pop-up screens. In Payroll, you can enter all of the job cost information before posting timecards and printing cheques. 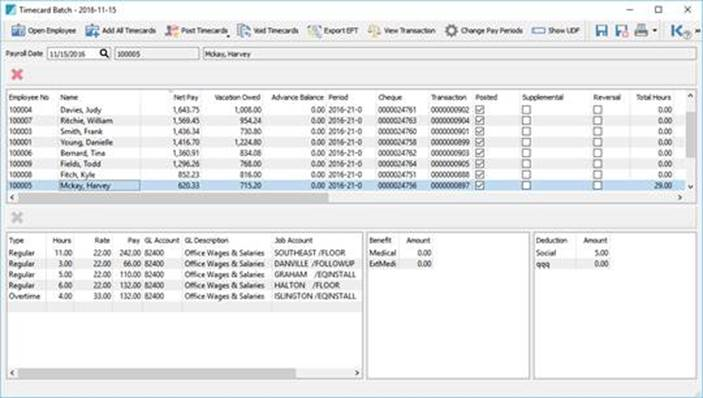 Also, timecards and job cost information can be imported from a spreadsheet or a timeclock export. Here’s a screenshot of how information will appear after data is entered or imported. You’ll notice that data is visible even after posting the timecard. This saves an extra step for the user as they will no longer need to job cost the employee benefits from Accounts Payable.